What Is the Importance of Giant Pandas? The giant panda, or Ailuropoda melanoleuca, is one of the most easily recognized animals on Earth and also one of the most endangered. 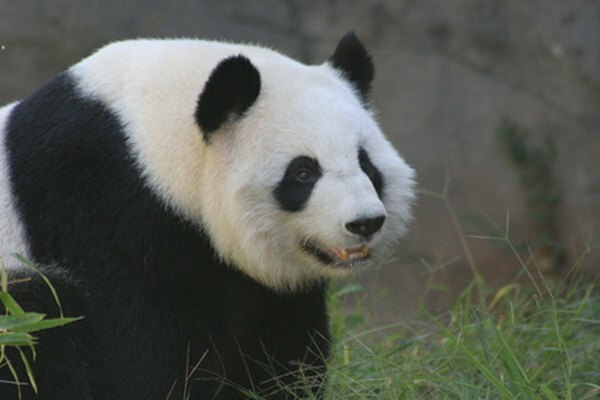 Native to China, the giant panda is now found only in Sichuan, Gansu and Shaanxi provinces in central China. Because they eat only bamboo in the wild, pandas are very vulnerable to habitat disturbance and climate change. There are believed to be fewer than 2,000 pandas surviving in the wild, with another 250 in captivity, most of these in China. The giant panda is an important species in its native forest habitat. By eating large amounts of bamboo, it prevents this vigorous species from dominating the understory and forcing out other species. Giant pandas also encourage bamboo thickets to regenerate and prevent them from dying of old age. Chinese culture and mythology has featured the giant pandas for thousands of years, either as Pixiu, a fierce and invincible creature as strong as a tiger, or as a more benign animal called Zouya. In battle during the Xizhou Dynasty, a flag featuring Zouya was used by armies to request a temporary truce. The panda was also regarded as a living manifestation of the opposing yin and yang forces which govern the universe thanks to its black and white coloration. Currently many Chinese people regard the giant panda as a symbol of national pride and a potent talisman. As a flagship species for conservation efforts in China, the giant panda is very important to overall efforts to protect diversity. In 1985 there were already 2.5 million acres of panda reserves, which protect not only the bears but all the other plants and animals in the area. The popularity of the giant panda, especially among children, makes it an excellent educational tool for environmentalists in China and the rest of the world. For many years the giant panda was classified somewhere between the bears and the raccoons. Thanks to genetic studies it is now thought to be an early offshoot of the bear, or Ursidae, family. Its nearest relative is the spectacled bear, or Tremarctos ornatus, of South America rather than the superficially similar red panda or Ailurus fulgenso of Asia. The giant panda is considered an important species because it is a "living fossil" with no close relatives. The World Wildlife Fund chose the giant panda as its logo in 1961 because of its iconic status and instantly recognizable features. The giant panda logo has remained an important part of the WWF’s fund raising efforts since. As giant panda numbers rise slowly and its future begins, however faintly, to look more secure, its fame will continue to help raise funds to protect other less attractive but just as important species.